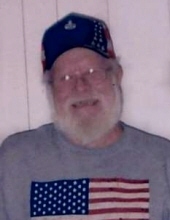 Kenneth R. Schnake, age 68, of Robbs passed away on March 18, 2019 at home. He was born in Vienna, IL on May 5, 1950 to the late Garland and June (Trammel) Schnake. He was a welder and worked on the AMAX dragline; as well as many other places. He is survived by two daughters, Cecilia Pesce, Gina Perry; two grandchildren, Hannah and Ben; two brothers, Dale Schnake, Bill Schnake. A memorial service will be held at 2:00 pm on Friday, March 22, 2019 at Aly Funeral Home in Eddyville, IL. Rev. Roy Baker will conduct the service. Military Honors will follow the service. Visitation will be from 1:00 pm until time of service. To send flowers or a remembrance gift to the family of Kenneth R. Schnake, please visit our Tribute Store. "Email Address" would like to share the life celebration of Kenneth R. Schnake. Click on the "link" to go to share a favorite memory or leave a condolence message for the family.